Periodical Cessation on the Saḅbath. Connection with the Alexander Legend. 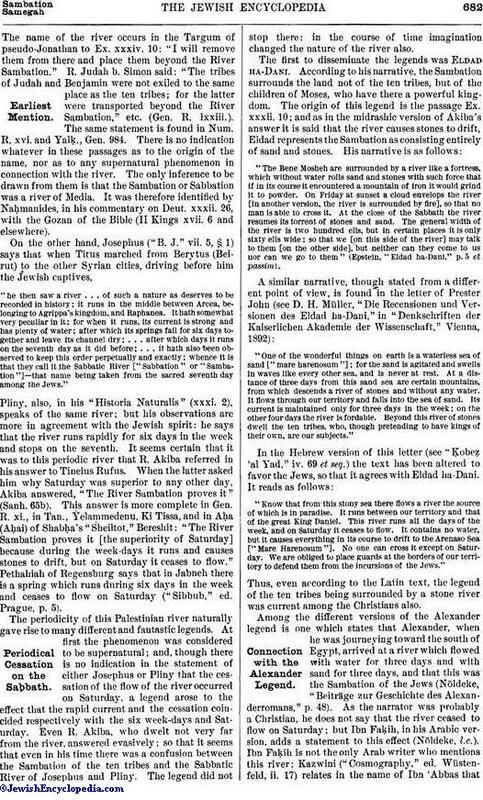 In rabbinical literature the river across which the ten tribes were transported by Shalmaneser, King of Assyria, and about which so many legends subsequently accumulated that it was considered by some scholars to be altogether mythical.The name of the river occurs in the Targum of pseudo-Jonathan to Ex. xxxiv. 10: "I will remove them from there and place them beyond the River Sambation." R. Judah b. Simon said: "The tribes of Judah and Benjamin were not exiled to the same place as the ten tribes; for the latter were transported beyond the River Sambation," etc. (Gen. R. lxxiii.). The same statement is found in Num. R. xvi. and Yalḳ., Gen. 984. There is no indication whatever in these passages as to the origin of the name, nor as to any supernatural phenomenon in connection with the river. The only inference to be drawn from them is that the Sambation or Sabbation was a river of Media. It was therefore identified by Naḥmanides, in his commentary on Deut. xxxii. 26, with the Gozan of the Bible (II Kings xvii. 6 and elsewhere). "he then saw a river . . . of such a nature as deserves to be recorded in history; it runs in the middle between Arcea, belonging to Agrippa's kingdom, and Raphanea. It hath somewhat very peculiar in it; for when it runs, its current is strong and has plenty of water; after which its springs fail for six days together and leave its channel dry; . . . after which days it runs on the seventh day as it did before; . . . it hath also been observed to keep this order perpetually and exactly; whence it is that they call it the Sabbatic River ["Sabbation" or "Sambation"]—that name being taken from the sacred seventh day among the Jews." Pliny, also, in his "Historia Naturalis" (xxxi. 2), speaks of the same river; but his observations are more in agreement with the Jewish spirit: he says that the river runs rapidly for six days in the week and stops on the seventh. It seems certain that it was to this periodic river that R. Akiba referred in his answer to Tineius Rufus. When the latter asked him why Saturday was superior to any other day, Akiba answered, "The River Sambation proves it" (Sanh. 65b). This answer is more complete in Gen. R. 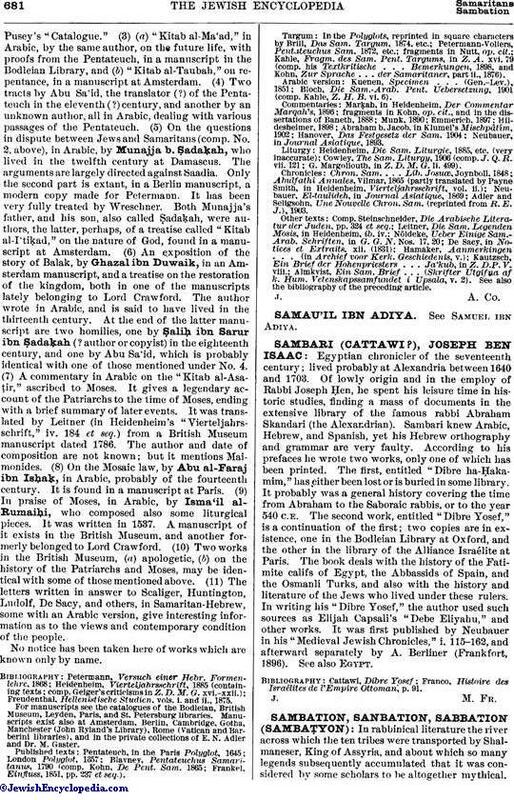 xi., in Tan., Yelammedenu, Ki Tissa, and in Aḥa (Aḥai) of Shabḥa's "Sheiltot," Bereshit: "The River Sambation proves it [the superiority of Saturday] because during the week-days it runs and causes stones to drift, but on Saturday it ceases to flow." Pethahiah of Regensburg says that in Jabneh there is a spring which runs during six days in the week and ceases to flow on Saturday ("Sibbub," ed. Prague, p. 5). The periodicity of this Palestinian river naturally gave rise to many different and fantastic legends. At first the phenomenon was considered to be supernatural; and, though there is no indication in the statement of either Josephus or Pliny that the cessation of the flow of the river occurred on Saturday, a legend arose to the effect that the rapid current and the cessation coincided respectively with the six week-days and Saturday. Even R. Akiba, who dwelt not very far from the river, answered evasively; so that it seems that even in his time there was a confusion between the Sambation of the ten tribes and the Sabbatic River of Josephus and Pliny. The legend did not stop there; in the course of time imagination changed the nature of the river also. "The Bene Mosheh are surrounded by a river like a fortress, which without water rolls sand and stones with such force that if in its course it encountered a mountain of iron it would grind it to powder. On Friday at sunset a cloud envelops the river [in another version, the river is surrounded by fire], so that no man is able to cross it. At the close of the Sabbath the river resumes its torrent of stones and sand. The general width of the river is two hundred ells, but in certain places it is only sixty ells wide: so that we [on this side of the river] may talk to them [on the other side], but neither can they come to us nor can we go to them". "One of the wonderful things on earth is a waterless sea of sand ["mare harenosum"]; for the sand is agitated and swells in waves like every other sea, and is never at rest. At a distance of three days from this sand sea are certain mountains, from which descends a river of stones and without any water. It flows through our territory and falls into the sea of sand. Its current is maintained only for three days in the week; on the other four days the river is fordable. Beyond this river of stones dwell the ten tribes, who, though pretending to have kings of their own, are our subjects." "Know that from this stony sea there flows a river the source of which is in paradise. It runs between our territory and that of the great King Daniel. This river runs all the days of the week, and on Saturday it ceases to flow. It contains no water, but it causes everything in its course to drift to the Arenaso Sea ["Mare Harenosum"]. No one can cross it except on Saturday. We are obliged to place guards at the borders of our territory to defend them from the incursions of the Jews." Thus, even according to the Latin text, the legend of the ten tribes being surrounded by a stone river was current among the Christians also. Among the different versions of the Alexander legend is one which states that Alexander, when he was journeying toward the south of Egypt, arrived at a river which flowed with water for three days and with sand for three days, and that this was the Sambation of the Jews (Nöldeke, "Beiträge zur Geschichte des Alexanderromans," p. 48). As the narrator was probably a Christian, he does not say that the river ceased to flow on Saturday; but Ibn Faḳih, in his Arabic version, adds a statement to this effect (Nöldeke, l.c.). Ibn Faḳih is not the only Arab writer who mentions this river; Kazwini ("Cosmography," ed. Wüstenfeld, ii. 17) relates in the name of Ibn 'Abbas thatone night the prophet asked the angel Gabriel to bring him to the land of the children of Moses ("Banu Musa"), who were reputed to be very righteous. Gabriel told him that it would take him six years to reach there and six years to return, and that even if he were there he would not be able to gain access to the Banu Musa, they being surrounded by a river of sand ("Wadial-Raml") which flows with the rapidity of an arrow, resting only on Saturday. Mas'udi ("Prairies d'Or," i. 161) also mentions a river of sand, in Africa. Finally Grünbaum (in "Z. D. M. G." xxiii. 627) concludes that the Sambation legend was current among the Samaritans also. "It is seventeen miles wide and throws stones as high as a house. On Saturday it is dry; there is then not a single stone, and it resembles a lake of snow-white sand. The Gentiles who dwell near the river do not drink of its water, nor do they give it to their cattle, considering it a sacred river. The water has, besides, a curative power in leprosy and other diseases. The river ceases to flow on Friday, two hours before sunset; and during this interval before the Sabbath the Jews make incursions into the neighboring lands." Manasseh b. Israel, while endeavoring to prove the existence of the Sambation, states, as a peculiarity of its sand, that even when it is kept in a glass it is agitated during six days of the week and is quiescent on Saturday ("Miḳweh Yisrael," x., No. 39). There are thus essential differences even among the Jews with regard both to the nature of the river and to the people which it surrounds. There is a difference of opinion also as to the locality of the river. It has already been said that, according to the midrashim, the Sambation must be identified with some river of Media, and that Naḥmanides identified it with the Gozan of the Bible. 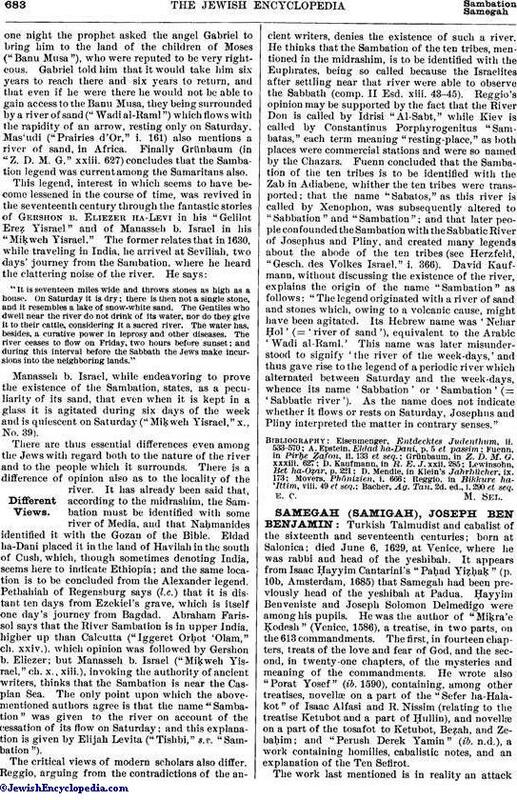 Eldad ha-Dani placed it in the land of Havilah in the south of Cush, which, though sometimes denoting India, seems here to indicate Ethiopia; and the same location is to be concluded from the Alexander legend. Pethahiah of Regensburg says (l.c.) that it is distant ten days from Ezekiel's grave, which is itself one day's journey from Bagdad. Abraham Farissol says that the River Sambation is in upper India, higher up than Calcutta ("Iggeret Orḥot 'Olam," ch. xxiv. ), which opinion was followed by Gershon b. Eliezer; but Manasseh b. Israel ("Miḳweh Yisrael," ch. x., xiii. ), invoking the authority of ancient writers, thinks that the Sambation is near the Caspian Sea. The only point upon which the above-mentioned authors agree is that the name "Sambation" was given to the river on account of the cessation of its flow on Saturday; and this explanation is given by Elijah Levita ("Tishbi," s.v. "Sambation"). The critical views of modern scholars also differ. Reggio, arguing from the contradictions of the ancient writers, denies the existence of such a river. He thinks that the Sambation of the ten tribes, mentioned in the midrashim, is to be identified with the Euphrates, being so called because the Israelites after settling near that river were able to observe the Sabbath (comp. II Esd. xiii. 43-45). Reggio's opinion may be supported by the fact that the River Don is called by Idrisi "Al-Sabt," while Kiev is called by Constantinus Porphyrogenitus "Sambatas," each term meaning "resting-place," as both places were commercial stations and were so named by the Chazars. Fuenn concluded that the Sambation of the ten tribes is to be identified with the Zab in Adiabene, whither the ten tribes were transported; that the name "Sabatos," as this river is called by Xenophon, was subsequently altered to "Sabbation" and "Sambation"; and that later people confounded the Sambation with the Sabbatic River of Josephus and Pliny, and created many legends about the abode of the ten tribes (see Herzfeld, "Gesch. des Volkes Israel," i. 366). David Kaufmann, without discussing the existence of the river, explains the origin of the name "Sambation" as follows: "The legend originated with a river of sand and stones which, owing to a volcanic cause, might have been agitated. Its Hebrew name was 'Nehar Ḥol' (= 'river of sand'), equivalent to the Arabic 'Wadi al-Raml.' This name was later misunderstood to signify 'the river of the week-days,' and thus gave rise to the legend of a periodic river which alternated between Saturday and the week-days, whence its name 'Sabbation' or 'Sambation' (= 'Sabbatic river'). As the name does not indicate whether it flows or rests on Saturday, Josephus and Pliny interpreted the matter in contrary senses." Bacher, Ag. Tan. 2d. ed., i. 290 et seq.